A page of information that didn't fit anywhere else. Lawrence Ormsby was born in Arizona, and has spent his life exploring and enjoying the state's natural wonders. From an early age, drawing was important to him. After serving four years in the Air Force as an illustrator, he pursued an education in art and design from Colorado Institute of Art. In 1979, he formed Ormsby and Thickstun, a partnership with Carole Thickstun, and began a career in interpretive design. 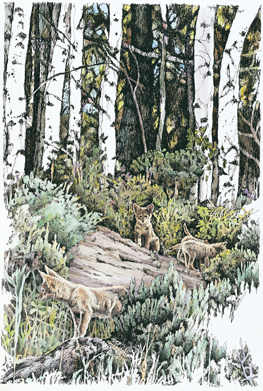 He honed his skills in pen and ink, watercolor, cartography, diagram, and three-dimensional modeling as different challenges in the interpretive field presented themselves. The work that he and his partner have done for national parks and forests have earned many national awards, but most importantly, have sold well and been enjoyed by many visitors. Carole Thickstun began designing at an early age, purchasing a small press in kindergarten and designing posters by third grade. While still in high school, she enrolled in Indiana University, and began taking classes in their just-emerging graphic design department. After completing all the design available at I.U. by her sophmore year, she transferred to University of Cincinnati, known for its strong program in graphic design. After three years there, she headed west and began freelancing in 1975. She met Lawrence in 1976 when they collaborated on The Pointe logo. In 1979, they formed their partnership, and began collaborating in earnest, pursuing projects from national parks, natural history associations, publishers and museums. "Very high quality publication. Well done! Awesome cover, it gets to the point and draws my attention to want to purchase the guide. Well organized content which makes it easy to obtain information quickly." Yes, I would love to see any of your product ideas. Your items have a great look and often do very well, so I do have interest. 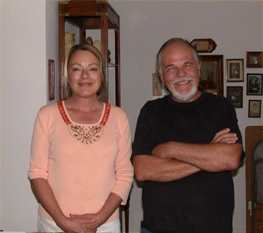 In 2002, Larry and Carole built their studio in Ironwood Forest National Monument, northwest of Tucson. 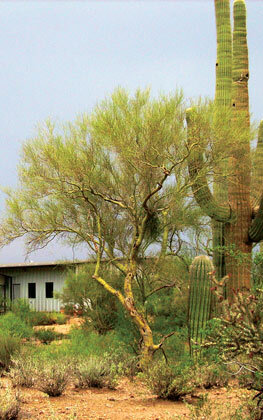 Their new space houses their etching, lithography and letter presses, and is surrounded by Sonoran desert. The new large space has allowed them to continue to expand the interest they share in art and design reflecting the natural world. by Michael Collier, Author and Photographer; Susan Tasaki, Editor; Lisa Oakley, Alaska Natural History Association, Project Manager. As a designer and illustrator team, we prepare illustrations, maps and diagrams for publications and exhibits. We create designs and products in an effort to create engaging content for the public. Internally, we each focus on different parts of projects for an efficient and effective flow of work. Lawrence’s uses his skills and research to create illustrations, cartography and 3-D diagrams. I focus on planning and design in order to present visually accessible layouts. I serve as the project manager, including scheduling, organizational details, handling submittals and reviews, and creating production costs estimates. I do most of the design layout and typography work. Our work is made "professional-looking" as a result of a network of talent--writers, editors, programmers, printers, and photographers--that I have established working relationships with, each with their own area of expertise. Our success is a result of their generous and gifted talents. Our Graphic Design Services are available to Arizona State agency projects with Statewide Marketing contract ADSPO12-036095. 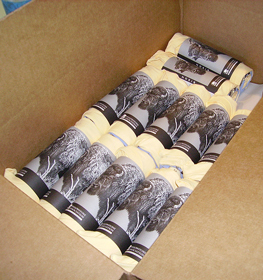 We create labels for most of our custom shirts. Buyers like the "packaged" look for presents, and store personnel like it for easy inventorying. We handprint most of our labels on a letterpress. There have been a few instances in my career that were truly lightbulb moments. Moments I knew I was witnessing something incredibly special. History was forming. Time seemed to stop. The trick is learning to recognize these moments and capitalize on them. Throughout my career I’ve watched some of the best interpreters in the National Park Service (NPS) at work. The most important skill I took away with me was the ability to “pull history.” To learn and extrapolate from the expertise of people with vast knowledge. To take the time to understand not just hard facts, but how places and events made people feel. What they smelled, tasted, and touched. Now I am excited about a new tool that allows us to experience these moments, virtual reality. One of my first vivid memories of watching an expert pull history occurred when I needed to deliver some documents to NPS interpreter John Martini on a Saturday. We made a special trip out to the Nike SF-88 site at Golden Gate National Recreation Area in the Marin Headlands. The site is only open to the public once a month. At this restored Cold War location, visitors are able to view underground missiles and learn a bit about the area’s history. I had envisioned jumping out of the van, passing off the materials to John, and being off. But it was not to be, my world was about to stop for interpretation, for pulling history. With the site open, persons who had served at the Army facility overlooking and protecting San Francisco in the 1960s began to arrive. The combination of knowledgeable people with first-hand experience and a curious and talented interpreter created the ideal environment for pulling history. The knowledgeable started remembering. They recalled details. They spoke of their feelings, of the fog. They describe their emotional state, of excitement, of honor, and fear. All at once the location came to life. History ceased to be abstract. It became concrete, tangible. It was at this moment that I observed John Martini in his element. Concentrating, recording every word, pulling history. Everything needed to hold for that instant, it was a priceless opportunity and one not likely to be repeated. Years later, I was able to help design a book by Martini that incorporated the interviews. The work, Last Missile Site: An Operational and Physical History of Nike Site SF-88, Fort Barry, California, brought those personal stories to life. The perspectives offered greater depth to the site and its history, and provided a link to the past for future generations to experience. Our job has always been to create visuals that tell stories. We’ve created (or recreated) archeological sites, forts, ranches, and prisons. Our first efforts were achieved in the 1980s, making cardboard models of two churches for the Pecos National Historical Park in New Mexico. We began by locating plans and extrapolating details from historical reports. The information was finalized into a set of drawings for displays and trail guides. Mistakes, and you will always have some when you are creating something that no longer exists, were difficult to fix in ink. It was a problem. Larry adapted to the 3D world of advanced architectural rendering in the late 1990s. He became adept at creating virtual models of buildings and whole sites. Those still images of recreated scenes from history represented a technological leap forward. Modeling Alcatraz to scale for the Golden Gate National Parks Conservancy was an immense project, but the images have endured. Sharing these recreated visions of history with experts and interpreters, we learn. They see and rethink what they see. We listen and attempt to comprehend these perspectives. The process continues. We are pulling history. As we learned from our mistakes and honed our process, we began to once again push the limits of our abilities. From old blueprints and fine black and white images from the 1890s, Larry recreated a detailed 3D rendering of Sutro Baths in San Francisco. As the images developed, John Martini would study, and could all at once remember a detail of a photo, or a quote about a particular feature. That input was constantly incorporated into the final product. Now, we’ve stepped into the next phase of interpretive visualization, virtual reality. We’ve moved past foam core models and static images. Advanced techniques like GPS mapping, polyplanes, and game engines allow us to model interactive experiences in greater detail and with greater precision than ever before. We can immerse the user and enable them to move through sites and interact with items on the screen as if they were there. We can incorporate social media features to connect with other people and share our experiences in ways not previously possible. We can pull history together. We have always had a special love for Southern Arizona’s mission at Tumacacori. In the 1980s, Larry and I created hand printed posters for the annual Fiesta de Tumacacori. We lived across the street, renting from the Chief of Interpretation, Nick Bleser, another expert in pulling history. After several years we were grasping at new ways to showcase the mission. In the 2000s, we had a chance to create a new visual for a wayside informational panel. We created a drawing of the mission church, courtyards and orchards as they appeared at the peak of Tumacacori’s mission years. Larry created a 3D model and shared it with the interpretive staff and historians. We solicited advice and made adjustments. With the basic mission built we found ourselves wanting more. We wanted to see it, move through it, and experience it as it might have been. We imported the Tumacacori schematics into a game engine. This allowed us to move around the site and experience it from different perspectives. Details, however, were still missing. The interior of the Church lacked any décor. The images still felt static, cold. We then began the arduous process of creating the interior as accurately as we could for the period (1860s). With guidance from experts Nick Bleser, Anita Badertscher, Dr. Bernard Fontana and Father Greg, and an outstanding Federal Works Projects diorama we began to piece together the Church. When we sent our first drafts of the church’s interior renderings to Father Greg we were amazed at his ability to pull history. His immense experience garnered after years of research allowed him to see things immediately that we had not considered. Something as simple as the placement of a candle sparked a memory that led to a fascinating historical perspective. Father Greg noted the candles were too tall. He proceeded to explain that almost constantly representatives of the mission were requesting greater acquisition of beeswax from the central authority. They didn’t have enough candles. The ones they did have were often used to the bottom. So a room full of tall candles was inaccurate. We took these notes, removed some candles and lowered the rest to appear much shorter. We will include an interactive feature that explains this historical perspective complete with primary source quotes. It is this kind of rich detail that immerses audiences and allows them to better understand the lives of the people that came before. We want to use our skills to create tools that connect experts to visuals of our shared past, and make it available to all. This is the driving force behind what we do. We've really loaded a lot of images into this section. Enjoy!